While it has been said before in forums, chats and websites on the internet that the J2 Frequency Map for Europe shows a resemblance to the borders of the Roman Empire, i have never seen an actual image comparing the two. I decided to make one for myself and upload it here. 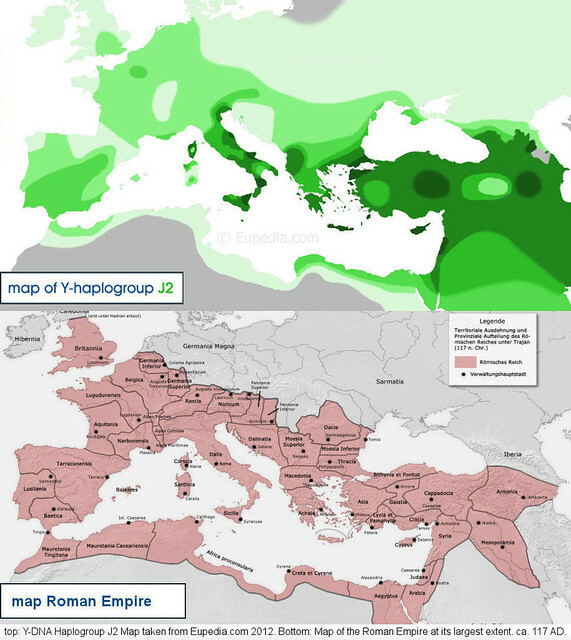 I used the current (2012) Eupedia.com J2 Frequency map and an image of the Roman Empire at its largest extent (about 117 AD). Eupedia.com tells us; "Romans surely helped spread haplogroup J2 across its borders, judging from the distribution of J2 within Europe (frequency over 5%) which bears an uncanny resemblance to the borders of the Roman Empire."